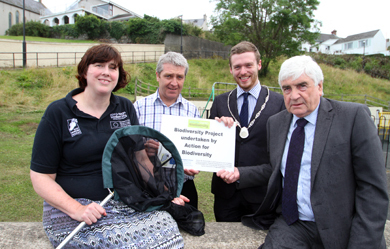 Abbey McSherry, Action for Biodiversity, with DJ Morgan, Down Dostrict Council Parks Officer, Vice Chairperson Gareth Sharvin and Ardglass Councillor Dermot Curran att the site where the wildflowers are being planted adjacent to the play area in Quay Street, Ardglass. BEES and butterflies are giving a big “antennas up” for the Bee Feast project in Down District this year. Areas in the district were selected for management and planting to encourage nectar loving insects such as bees and butterflies. At Roughal Park in Downpatrick, a high colour mix of butterfly, bird and bee attracting flowers along with some meadow grasses and a selection of traditional cornfield annuals were planted for a beautiful flower bed that has buzzed with life during recent hot weather. In Newcastle a larger area has been set aside at Island Park for a wildflower meadow consisting of cornfield annuals, fine leaved grasses and native perennials which will provide a range of flowers of different types over at least four years. “However this change of management will take a few years to bed in and really show its results. In autumn last year some 42,000 bulbs of simple narcissus, grape hyacinths, spring crocus various aliums, crocosmias and autumn crocus were planted across the slopes. Bee Feast in Down District is part of the regional project ‘Marvellous Meadows and Bumbling Bees’ that Action for Biodiversity is undertaking across the ten local authority areas of the East Border Region. 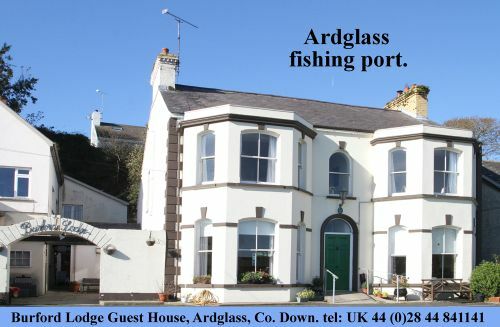 This initiative is part of the Action for Biodiversity Project which is part funded by the European Union’s Regional Development fund through the INTERREG IVA cross border programme.